Before moving on to the top secret October challenge for the Daring Bakers, I had to make one more batch of cinnamon rolls, and I know they won’t be my last. In this particular case, though, I had offered to bring treats for a staff meeting the Friday before the challenge was posted, knowing I would be able to bring fresh cinnamon rolls and sticky buns. Because the meeting was postponed until the 5th, I ended up making a fresh double-batch of cinnamon rolls Thursday night. No longer under the constrictions of the Daring Bakers guidelines, I made a few slight tweaks here and there, and thought I would document the differences between my first batch of rolls and these. As I mentioned above, I made a double-batch of the dough. I got it started at lunch-time so that it could rise over the course of the afternoon, but that meant a bit of time constraint in the preparation as well. I didn’t bother heating the buttermilk this time, but otherwise used all the same ingredients in the dough, and mixed it in my stand mixer until it came time to switch to the dough hook. I don’t have a huge mixer, and it quickly became clear that the amount of dough was going to overwhelm the hook, so I had to pull it all out and knead by hand. I added quite a bit of additional flour as I was kneading to prevent stickiness, and recruited Jeremy for some muscle. By the time we were through, I had a dough that felt similar to the first, if a bit less silky, and which windowpaned only with a bit of tearing; the original dough was ultra-smooth and pliable, windowpaning without even threatening to tear. I separated the dough equally into two bowls, got the dishwasher running, and left for the afternoon. When I returned, the dough had risen very little. I did some proofing in the oven (and then on top of the oven, as I had a sirloin tip roast waiting for its turn), and by the time I was satisfied with the rise, the dough was nicely warm under my hands. I proceeded to try and roll out one ball into a rectangle, and found that it was much more difficult to do this time around. I think the overnight rise of the first batch allowed the gluten in it to relax completely, and it rolled out with absolutely no problem. This second batch kept snapping back, and my rectangles were more small and misshapen than I had anticipated, not to mention full of air bubbles that got in the way. I started getting anxious that I would overwork the dough and make my rolls tough, so eventually I gave up and spread on the filling. This time around I adjusted the filling, because the rolls weren’t as gooey as I could have hoped. I just softened up some butter and spread it on with a spatula before sprinkling on my cinnamon-sugar. The sugar mixture ended up as part granulated white and part organic sucanat, because I ran out of the former. I pinwheeled the dough without too many problems, and lost less filling to the counter-top, a result of the butter’s adhering properties. At the same time, the rolls didn’t seal themselves shut as well as the first batch, which I chalk up to the butter as well. I arranged 15 slices on a silpat for their second rise, and tucked the last 6 into a glass casserole in the fridge for Jeremy on Saturday morning. When the roast beef was done and the oven had cooled back down to a reasonable proofing temp, I popped the tray back in to facilitate the rise, which again seemed to take longer this time around. 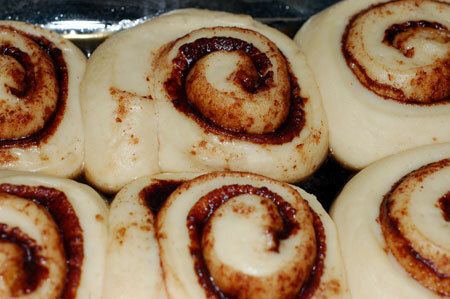 Eventually I was satisfied and baked off the rolls. They were nice and fluffy out of the oven, if not quite as large as my first batch. I rubbed their tops with a bit more butter, let them cool a bit, and packed them away. In the morning I made up some glaze (vanilla instead of lemon extract this time, for Jeremy) and drizzled the rolls thoroughly, hoping to impart a greater goo factor to them because they stiffened up quite a bit overnight. They went over well at work, and were nearly all eaten up, but when I sampled one, it was definitely on the dry side and consequently not as decadent as last weekend’s batch. A visit to the microwave made a vast improvement.